Arriving in New Zealand as a 13-year-old who could speak no English, Hans Schuitman hated school and chose to quit. But the Dutch immigrant- who died recently aged 67 - would go on to become a leading Christchurch businessman and philanthropist and a passionate Kiwi. Hans left Papanui High School at 14 and worked as a butcher and drainlayer. He then served his apprenticeship as a toolmaker at Crown Crystal Glass in Hornby, where his father was an industrial chemist. This work brought out his zeal for design and manufacturing and he began night classes at Christchurch Technical College. 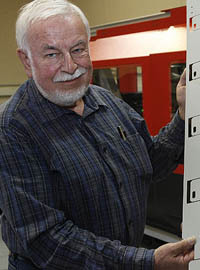 He continued studies in engineering after completing his trade and advanced trade certificates in fitting, turning and machining, while working at PDL Industries as a tool designer from 1964. He became a member of the Institute of Production Engineers and a Chartered Engineer. While working at Crown Crystal, Hans met his future wife, Carolyn (née Handley) and they married in 1967. Hans Schuitman — Industrialist Hans progressed to chief design engineer at PDL, in charge of product development, tooling and manufacturing systems. He left the firm in 1973 to establish his own company, Carlton Manufacturing, which designed and made a wide range of products. Most notable was the multiplug box for electrical connections, which, Carolyn says "was his brainchild". He also secured the contract to manufacture Breville small home appliances. As the company grew, Hans formed a new venture, Component Engineering, and in 1990 he set up Shape Technology. Twenty years later, Shape is a major manufacturer in Christchurch, with a staff of 100 in modern premises at Addington. The company won the Champion Canterbury Producer/ Manufacturer Award in 2009 in the medium/large enterprise category, and that year Hans was also one of 16 national finalists in the Ernst & Young Entrepreneur of the Year awards. He had great ideas and was NEVER seen without a notebook and pen in his pocket to jot them down. Hans Schuitman — An all rounder ! Colleague John Campbell says Hans was a combination of practical man and visionary. He mapped out a realistic course to make each dream a reality, and was very focused on whatever project he had in hand. "He was a great mentor to many, many people", Carolyn said. He remembered them and kept in touch for many years. John said "he was very positive and had the knack of making people feel good about themselves!" Hans could class people as those who saw opportunities and those who saw problems, and had no patience with the latter, John Campbell says. He developed a personal business philosophy based on positivity and love of New Zealand, and was sought-after as a speaker around those themes. He called for "vigorous support" for innovation, saying it could lift productivity by 40 per cent and ensure wealth for the nation's future. The success of his businesses allowed Hans and his wife to support many worthy causes. Despite being a noted philanthropist, he largely shunned the limelight. He built a grand home on large grounds in North Canterbury where he acould run events such as garden tours as fundraisers. There he and John established Flaxwood Festival, as an annual event. 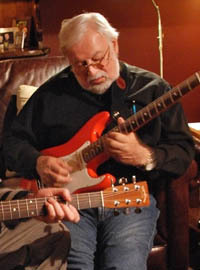 Hans had always loved music, especially the popular jazz styles of the 1960s and 1970s, and he was a huge fan of the The Shadows, learning to play electric guitar like his hero, Hank B. Marvin. Carolyn says he practised for months to play in front of an audience of 500 at the first festival. He played the Shadows number "Theme for Young Lovers" — it was his first time on stage, and he loved it. His eyes sparkled, and it was a happy moment for him. As his daughter Kim remarked at the funeral — "He packed three lives into one." Hans was a keen tramper and climber and made many trips to the South Island ranges. He loved the sea and kept a yacht, and then a motor launch, and had a house in the Marlborough Sounds. He gained his pilot's licence in 1974 and flew Canterbury Aero Club planes frequently on business trips and holidays. His hobbies included building model steam engines and boats, flying model helicopters and collecting antique firearms. Carolyn says he would tackle any practical task and built two fine family homes, for which he designed unique features and hardware. He remained fluent in Dutch and returned to Holland several times. He was teaching himself German and had progressed to the stage of reading German books when he died. He had planned to learn French next. Hans was born in Arnhem, Holland on February 18th, 1944 and he died in Christchurch on September 28th, 2011. He is survived by his wife Carolyn, his daughter Kimberli, his son Glenn and two grandchildren (Madeleine and Amelie).